On July 12, President Trump’s Council of Economic Advisers released a report titled “Expanding Work Requirements in Non-Cash Welfare Programs” in response to an April 2018 executive order on reducing poverty in America. The CEA’s basic argument is simple: The war on poverty has been won — properly measured, the poverty rate is just 3 percent, a historic low. However, victory has left an ever-increasing number of able-bodied working-age adults dependent on in-kind welfare, especially on Medicaid, SNAP (formerly food stamps), and housing assistance. This problem can best be addressed by expanding work requirements for non-cash welfare programs. Work requirements will encourage self-sufficiency, strengthen the economy, and ultimately benefit the welfare recipients themselves. The CEA is right, at least in part, in its critique of current in-kind public assistance programs. However, the picture it draws is misleading in a number of ways, and the case it makes for work requirements is unconvincing. There are better ways to address the weaknesses of the current welfare system. Here are some questions that need to be addressed before undertaking a wholesale expansion of work requirements. Is the war on poverty really over? Let’s begin with the CEA’s controversial assertion that the war on poverty is over, as implied by the following chart from the report. 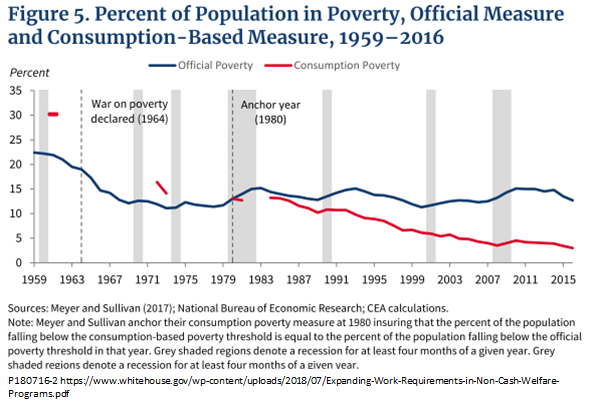 The blue line in the chart shows the official poverty rate, while the red line shows a consumption-based poverty measure devised by Bruce D. Meyer of the University of Chicago and James X. Sullivan of Notre Dame. By using consumption reported from consumer expenditure surveys, consumption-based poverty measures help overcome the problem of under-reported income, and arguably give a better picture of the wellbeing of the poor. (See here and here for samples of these authors’ many publications on the subject.) As we see, the official rate has changed little since the late 1960s. In the chart, the Meyer-Sullivan consumption poverty rate is calibrated to make the two series equal in 1980, which is the earliest date for which consistent data are available. From that point, consumption-based poverty appears to have fallen to about 3 percent today. On the “yes” side, we should note that the Meyer-Sullivan measure is based on academically respectable research published in credible journals. The authors’ critique of the official poverty rate is largely mainstream: First, the official rate uses an after-tax cash measure of income that omits benefits from some of the largest antipoverty programs, including the Earned Income Tax Credit (EITC), SNAP, housing assistance, and Medicare. Second, it is adjusted for changes in purchasing power using the standard consumer price index, which is widely thought to overstate the rate of inflation. Third, its data sources undercount some resources that may be more accurately captured by consumption data. That does not mean, however, that 3 percent should be treated as the definitive poverty rate, as it is by the CEA report. The Meyer-Sullivan approach, too, is open to criticism on grounds of methodology and data sources. (See here and here for examples.) It should properly be seen as just one of many alternative measures of poverty, each of which highlights some aspects of being poor and downplays others. In fact, Meyer and Sullivan themselves offer variants of their consumption poverty measure that show rates much higher than 3 percent, depending on whether they use an absolute or relative definition of poverty, and depending on the year used to link their series to the official one. The most important point, however, is not whether the Meyer and Sullivan measure of poverty is too low, but rather, why it is so much lower than the official rate. In large part, the reason is that in-kind welfare programs, especially the expansion of Medicaid and SNAP, really have made substantial improvements to the living standards of the poor. But those gains are fragile. They could easily be reversed if ill-advised reformers withdrew the support offered by existing in-kind programs without putting something better in their place. Who are the nondisabled working-age adult in-kind welfare recipients, and why do they work so little? The CEA report draws a sharp distinction between welfare recipients whom “society expects to work,” and those not expected to work. It refers to the former as “nondisabled working-age adults,” whom it defines as people aged 18 to 64 who have not qualified for Supplemental Security Income, Social Security Disability Benefits, or Veterans Disability Compensation. In a key chart, it notes that this group has far lower employment rates than nondisabled, working-age adults in the general population. As of 2013, nondisabled working-age adults accounted for a majority of recipients of all three forms of in-kind welfare. Of those, 60 percent of Medicaid and SNAP beneficiaries and 52 percent of housing beneficiaries worked fewer than 20 hours per week. 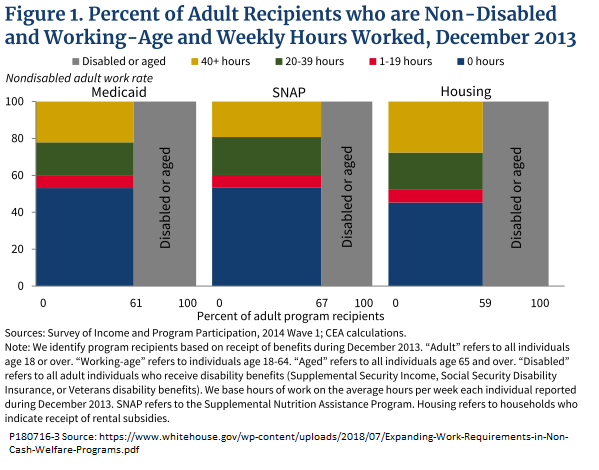 Those rates of nonwork are considerably higher than the 28 percent of nondisabled working age adults among the nonwelfare population who worked fewer than 20 hours per week. Why do the nondisabled, working-age welfare recipients work so little? The CEA report attributes their low employment rates to the work disincentives of in-kind welfare programs, which systematically reduce benefits as earned income rises. When benefit reductions are combined with income and payroll taxes, the CEA report estimates the effective marginal tax rates facing in-kind welfare recipients to range from 20 to 90 percent. Like most economists who have studied the matter, I agree that antipoverty programs are rife with disincentives to work. (See here and here, for example.) However, high effective marginal tax rates are only part of the story. A balanced analysis must also take into account other causes of weak labor-market attachment among welfare recipients. A study of nonworking Medicaid recipients by the Kaiser Family Foundation provides some perspective. Like the CEA report, the KFF study excluded Medicaid recipients who had qualified for SSI or SSDI disability payments. It found that just 39 percent of officially nondisabled Medicaid recipients did not work at all. Of the 39 percent who did not work, 31 percent reported caretaking duties as the reason. Fifteen percent reported that they did not work because they were in school, 36 percent cited poor health or disability, and 18 percent gave other reasons. Each of these categories raises issues not adequately discussed by the CEA report. The CEA does discuss child care as a factor in low work rates, but not caregiving duties toward other family members, such as disabled spouses or elderly parents. It altogether ignores study as a reason for nonemployment. But that is not all. The CEA report pays no attention to the large number of in-kind welfare recipients who do not qualify for SSI or SSDI benefits, but still report illness or disability as their reasons for not working. That is a major red flag. It is simply not true that enrollment in official disability programs is an accurate indicator of “disability” in any sense that is relevant to labor-market behavior. According to other data supplied by KFF, a quarter of nonworking Medicaid adults without SSI have mobility or physical limitations such as difficulty going up or down stairs (24 percent), walking 100 yards (25 percent), sitting or standing for extended periods (27 percent), or stooping, kneeling or bending (24 percent). Many live with daily, activity-limiting pain. The official SSI and SSDI programs are not tailored to such partial disabilities, nor to illness or injuries that are temporarily disabling, but from which full recovery is likely. Furthermore, even for people who do develop permanent disabilities, getting accepted into disability programs can take months or years. Enrolling in these programs often requires expensive legal assistance to navigate multiple rounds of rejection and appeal. Some who are truly disabled are discouraged from applying at all. At any time, then, there is a pool of fully disabled persons who have not yet qualified for SSI or SSDI, but who are unlikely candidates for employment regardless of effective tax rates, work requirements, or other policy details. Finally, consider the people who give other, unspecified reasons for not working. Many of them have one or more other characteristics that are not technically “disabilities,” but that make it difficult for them to find and hold jobs. Substance abuse and criminal records are two of the most important. Other people have borderline mental issues such as depression, anxiety, and mild forms of autism that may fall short of diagnosed mental illness but still make them hard to employ. In short, it is not reasonable to compare “nondisabled working-age adults” who are on welfare with those who are not. Some of the difference in their employment does reflect the disincentives of high benefit-reduction rates, but not all. Part also reflects a natural sorting according to employability. Better policy would help, but the fact remains that we are dealing with a population that is always going to be at risk of being the last to be hired and the first to be fired. Are work requirements really effective? First, any employment gains were modest. In the most successful experiment (Portland, Oregon), 85.8 percent of those in the group subject to work requirements worked during at least one of the 20 quarters of the study period — only slightly more than the 81.7 percent for the control group. In five of the 11 experiments, the differences in employment were not statistically significant, and in one case, employment was actually lower after imposition of work requirements. Note that even these modest gains are based on a far lower standard for “employment” (some kind of job in at least one calendar quarter over a five-year period) than the standard used in the CEA report (20 hours of work every week). Second, where the imposition of work requirements did result in work, most of the gains accrued to taxpayers rather than participants. Ten of the NEWWS experiments tracked combined wage and benefit income over the five-year period. In six of them, the increase in wages earned was less than the decrease in benefits. Averaged across all ten experiments, participants subject to work requirements experienced about a 1 percent reduction in total income. In the light of those data, it is a stretch to say that work requirements moved large numbers of people to meaningful self-sufficiency. Third, and most importantly, the NEWWS experiments produced positive results only where work requirements were backed by intensive administrative support. Running a successful welfare-to-work program requires adequate funding and well-trained staff. Case workers and other administrators must do more than simply monitor eligibility and compliance. In the successful Portland experiment, case workers interacted one-on-one with participants to cajole them into jobs or training programs, or to coerce them to make greater efforts by threatening withdrawal of benefits. Experiments in cities like Oklahoma City and Detroit, where staffing and administrative funding were lower, reported no statistically significant increase in employment. The CEA report makes only the most off-hand references to the need for administrative support, even though without it, there is little hope of moving large numbers of people from welfare to self-sufficiency. But perhaps the very neglect of this topic gives us a hint as to the real agenda of those pushing for the expansion of work requirements. If the objective is true self-sufficiency, work requirements are unlikely to be effective. However, if the objective, instead, is simply to cut in-kind welfare rolls, work requirements hold out greater prospects for success. You don’t need a Ph.D. in economics to understand that this change in the message is likely to reduce the number of people receiving benefits. Furthermore, if the objective is simply to cut the number of beneficiaries, it becomes irrelevant whether those leaving Medicaid, SNAP, or housing assistance actually become employed or simply disappear into the streets. In either case the amount of required administrative support is greatly reduced. The struggle between these alternatives — programs with low administrative budgets designed to thin out the welfare rolls or administratively more costly programs that actually encourage self-sufficiency — is being played out right now as many states seek federal waivers to impose work requirements for Medicaid. Some states have decided to not implement the waiver authority that they have received due to administrative costs. For example, Arkansas did not implement its health savings accounts after considering a number of factors, including the administrative expense of the accounts and the size of the monthly contributions members would make. Indiana is seeking to amend its waiver that originally set premiums at 2 percent of income and wants to change to a tiered structure instead, citing administrative complexity and costs. Kentucky amended its waiver application seeking to move from a tiered hour work requirement (depending on length of program enrollment) to a flat hourly requirement, also citing administrative concerns. Unlike TANF agencies or workforce development agencies, state Medicaid agencies are generally not currently equipped to develop, provide, and administer work support programs. We know that for every additional piece of paperwork that is required, fewer people are able to secure or retain coverage. A work requirement compels people to submit documentation of their hours worked (sometimes from multiple jobs) on a regular basis. Failing to submit paperwork — even when they are working and meeting the work requirements — will cause people to lose their Medicaid coverage. Work requirements do not reflect the realities of today’s low-wage jobs. For example, seasonal workers may have a period of time each year when they are not working enough hours to meet a work requirement and, as a result, will churn on and off the program during that time of year. Or, some may have a reduction in their work hours at the last minute and therefore not meet the minimum numbers of hours needed to retain Medicaid. Many low-wage jobs are subject to last-minute scheduling, meaning that workers do not have advance notice of how many hours they will be able to work. This not only jeopardizes their health coverage if Medicaid has a work requirement but also makes it challenging to hold a second job. If you are constantly at the whim of random scheduling at your primary job, you will never know when you will be available to work at a second job. This will lead to greater “churn” in Medicaid as people who become disenrolled reapply and enroll when they meet the work requirements. The Earned Income Tax Credit is the one existing policy that follows that approach. For the lowest earners, it actually increases benefits, rather than cutting them, as earnings rise. The CEA report cautiously endorses the EITC and suggests extending it to single workers. Other observers have proposed more far-reaching reforms that would extend coverage, make benefits monthly rather than annual, and ease benefit reduction rates for people just above the poverty level (see here, for example). But the EITC is only one among many proposals that would reduce the work disincentives inherent in today’s in-kind welfare programs. Some proposals focus on consolidating programs to simplify administration and reduce the high benefit-reduction rates that affect people who qualify for multiple programs. Others seek simplicity and flexibility by converting in-kind benefits to cash. Milton Friedman’s idea of a negative income tax is a proposal with good conservative roots that combines cash benefits with lower benefit-reductions. A universal basic income is a newer idea with a progressive tilt that goes even further in the same direction. Either could be a win-win for welfare recipients and for hardworking taxpayers. No more Catch-22 documentation requirements, no more armies of bureaucrats to sort people into categories and monitor their every move, no more shame-the-victim rhetoric to justify refusing to help the truly needy.